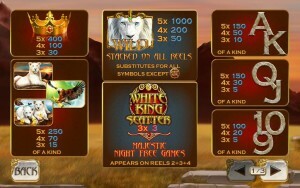 White King is a Playtech slot machine. A modern game, it is themed around white lions, rare creatures that are found in a certain part of Africa. It’s the first time I see a slot machine dedicated to these big cats, which can be found in the Timbavati area in South Africa. The color mutation is the only thing that sets them apart from the regular African Lion. This game which is dedicated to the white lion is just as beautiful as the creature that inspired it. One of the things I liked about White King is the use of a lot of paylines (40) on its 5 reels. The features, while they include stacked wilds, scatters and free spins, don’t appear as interesting, plus the slot only pays up to $50,000, which is quite low for this developer. As you play the game, you will find that there are stacked wilds available for all the reels, plus free spins and scatter symbols. The features look good enough, but they feel more limited than they are in other modern slots. 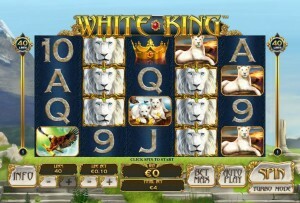 The White Lion, a majestic big cat with a huge mane, is the game’s stacked wild. It is allowed to appear on all the available reels and it can act as a substitute for any other symbol, the scattered Logo being the one exception. The wild also forms its own combinations, and even though the prize only goes up to 1,000x, the stacked attribute allows it to form multiple combinations at the same time in almost every case. The scatter symbol is the one with the White King Scatter Logo on it. This symbol is only present on three reels out of five, the three from the middle. You get a reward when all three are present, consisting in a prize worth 3x the bet and in free spins. When all three scatters are on the reels, you get 5 free spins in addition to the small prize I already mentioned. There aren’t too many free spins as you can see, but you get more stacked wilds for the duration of this feature and you can retrigger the spins with another three Logos. You have a maximum of 40 lines which you can play with, the Lines option being the one you use when you want to activate or deactivate some of them. Each line gets a single coin wager, with the denomination ranging from $0.01 to $50. If you decide to wager like a high roller, your bets can go as high as $2,000. Combinations formed by the stacked wilds will offer 1,000 coins each, so $50,000. Multiple combinations will usually be formed at the same time, thanks to the stacked attribute. The design is one of the best things about White King. The quality is there, no matter at what part you look. The betting options are placed on slabs of marble with a golden decoration around each one, with the reels being colored in a dark blue that works out great when the white of the lions is also present. A beautiful view of mountains and some ruins is used as the background in this case. Symbols: White Lion (wild, 1,000 coins), White King Scatter (3x the bet, scatter), Gold Crown (400 coins), White Lioness (250 coins), White Lion Cubs (250 coins), Eagle (250 coins), Ace (150 coins), King (150 coins), Queen (150 coins), Jack (150 coins), 10 (100 coins) and 9 (100 coins). You will enjoy the design of the game, the unique theme and the stacked wilds, but you will probably want more out of the features section. Still, it’s a game I’d recommend you give a try. 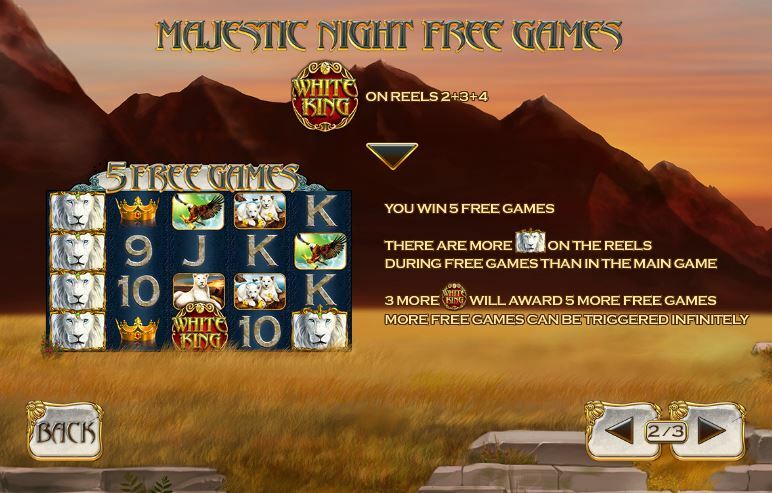 The White King slot machine is offered through the Playtech platform, so if you want to play it for real or just to practice, look out for casinos that use it.